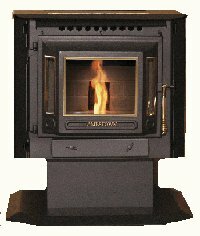 The Jamestown J2000 is similar to the J1000 stove, but larger. It has the capacity to produce 45,000 btu. and can heat an area of up to 2,200 square feet with a maximum burn time of 58 hours without the optional hopper extension. A wall thermostat is supplied as standard with this stove, as is the brick effect fireback. The full view door is a bay window style with the glass in three pieces and without pillars to obstruct the view of the fire. A door with pillars is available. This stove has a large choice of options, including cast iron legs or a pedestal base, an etched picture in the glass viewing window, and a steel carpet/floor protective plate. See options below. Max. Heat Output 45,000 btu. Window Size Full view door, 15.5 in. by 8 in. Pillar door, 11 in. by 8 in. Rear Vent Height With cast legs, 11.9 in. Pedestal, 13.5 in. Construction Type Fabricated steel, cast iron door. Hopper extension, increasing maximum burn time to 90 hrs. The J2000 is considerably deeper, at 24.5 inches, than the J1000, but not compared with other stoves of the same output. Clean out ash pan, clean the heat exchanger, clean inside the firebox. Clean ash from internal stove venting. Clean the combustion and convection blowers and the back of the stove. Check and clean the flue. If you would like to leave a review of the Jamestown J2000 pellet stove, please use the form on the contact page.